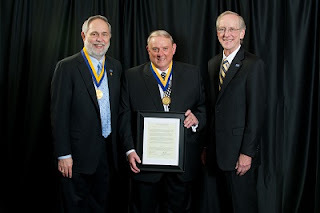 I am pleased to share with you the remarks I made when I was honored as a Distinguished Alum by Texas A&M University-Commerce. I know that there are faculty members at RCC who are also teachers who mold lives. I came to East Texas State College in the fall of ’62 as half the man I am today! I was a shy and naïve graduate of Woodrow Wilson Hugh School, Dallas, Texas, with not a clue of what I wanted to do with my life. I ended up in Paul Johnson’s Personality Foundations class, a required part of ET’s general education curriculum. Now, more than fifty years later, after 46 years as a college administrator, I truly appreciate ET’s well crafted program of study. Paul was a wonderful teacher and it means a great deal to me that he is here this evening. Paul’s course, Personality Foundations, molded the philosophy that I own today. Paul was one of a group of outstanding educators who taught me more than they will ever know. 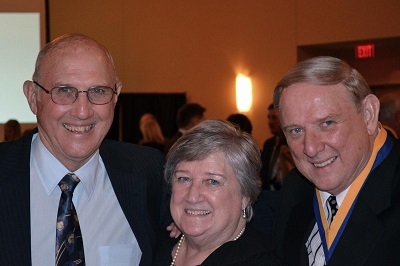 Bill Truax, John McQuery, Harold Murphy and Ruth Ann White were an extraordinary group. The Personality Foundations course developed by ET Administrator, Clyde V. Amspiger, was based on the understanding Laswell’s Eight Values: RESPECT, RECTITUDE, WEALTH, WELL-BEING, POWER, ENLIGHTENMENT, AFFECTION and SKILLS – Rail Road Wide Wide PEAS – some of you may remember – there is nothing wrong with rote. The overall theory on which the course was based was the worth and dignity of every individual in theory and in fact. Thus, my journey began and this was the theoretical basis for what I learned as a boy in church – God loves all the little children of the world – ALL of the children. And, so, by chance, I began my career at Tarrant County Junior College not realizing that community colleges would become my life and my mission. Today, I say to the very diverse groups that I greet each fall: “Be proud of your community college education for it is America’s gift to the world of higher education.” Community colleges help our great country fulfill its promise of access and opportunity for all. And it was Old ET that provided this access and opportunity for me for I spent eight years here at ET and earned three degrees. As I earned a Master’s Degree in Counseling, my life was shaped by the teaching of the great educator, Carl Rogers on whose theories our program was based. Rogers wrote that we are part of all with which we come in contact. I am and I was shaped by this great university that gave me a first–class public education. However, my leadership and social skills were shaped by my brothers of Delta Tau Delta, a major influence in my life. And I thank all of you who are here this evening. Your presence here is the best gift and I wish I could mention each of you by name. And I must mention my mentor and our fraternity advisor, Biology Professor Dr. R. K. Williams and his wife Bobbi, who always provided me with a safe shelter. 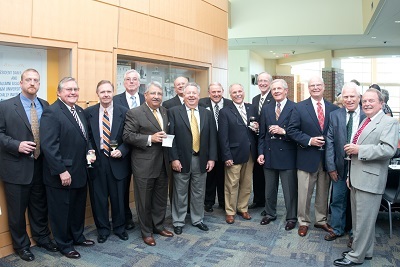 Members of my Delta Tau Delta pledge class, 1962, all of whom remain close friends today. who also shaped my life. My sister, Anne, and her husband, Jerry, and my brother Gaylon, and his wife Audrey, are here and they also shaped my life. And my chosen brother and sister, Marilyn and M.U. Ayres, are here and they are so special to me and support me always. And I am grateful to my wife, Wylene, my wife of 26 years, my heart and the love of my life. We are blessed with four wonderful grown children: Caitlin, Caleb, Marie and Toni - who all have every parents dream: jobs with benefits. And, here I must also mention my children’s grandparents, former President Bub and Martha Jo McDowell, who were always so good and kind to me. So, President Jones, Alumni Association, and all who are part of this great university, Texas A&M Commerce, I thank you and I am so proud and impressed with the growth I see here. I am also enormously proud of this great honor you have bestowed on me. Hail, oh Hail, ET, thank you for helping shape who I am. Distinguished Alumni Chapter, Texas A&M University-Commerce.